To give voice to 35 workers killed on the job over the past 35 years at a massive refinery in Texas City, hundreds of surviving family members, co-workers and friends gathered there last month to erect white crosses marked with their names. They conducted the ceremony on the 10th anniversary of an explosion that killed 15 workers and injured more than 170, including townspeople. Marathon Petroleum Corp., which bought the refinery from BP two years ago, did its best to shut the mourners up. 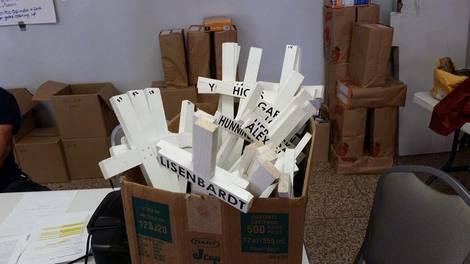 Marathon uprooted the crosses and tossed them in a box like trash within hours of the commemoration. For years during contract negotiations, the United Steelworkers (USW) union has pressed ungodly profitable oil companies to improve safety. This fell mostly on deaf ears. On Feb. 1, USW refinery workers began loudly voicing this demand by striking over unfair labor practices (ULP). Ultimately 7,000 struck 15 refineries. Within six weeks, all but five oil corporations settled. Marathon is a hold out. It wants to cut safety personnel. It does not want to hear about dead workers. Yet the (ULP) strike is about dead workers. Over the past five years, at refineries nationwide that employ USW members, 27 workers have died – incinerated, gassed or crushed to death. And the peril of refineries spills into communities. In Texas City at the refinery owned by BP in 2005, flying glass from windows shattered in the explosion injured townspeople. In the first six weeks of this year, explosions occurred at three refineries, closing streets, raining eye-irritating white ash on neighborhoods and forcing residents to shelter indoors for hours. 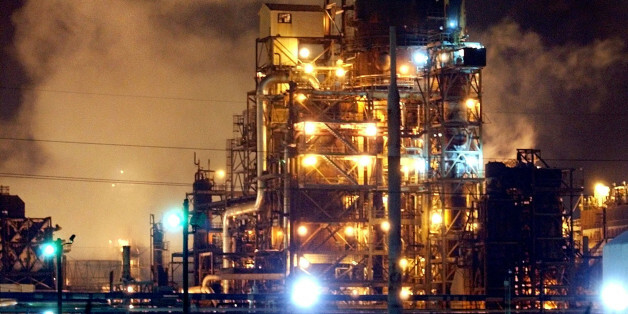 As the USW strike over unfair labor practices drags on in Texas City at what is now called the Marathon Petroleum Corp. Galveston Bay Refinery, USW members feel Marathon’s demands for reduced safety measures indicate the corporation refuses to hear the cautionary tales of the facility’s deadly past. Brandi Sanders, treasurer for the local union there and a 10-year veteran maintenance worker, told me that it is as if Marathon believes the 2005 explosion and the 20 other deaths since 1980 don’t exist because they didn’t occur on Marathon’s watch. “But the union does not want to go back. We lived through those experiences. And we learned from that history. And we should not be forced to repeat it,” Sanders said. That was the reason for the candlelight ceremony on March 23. To make those deaths real for Marathon managers who did not experience them in the visceral way that co-workers and families and neighbors did. The mourners marked each of the 35 crosses with the name of a worker killed at the nation’s fifth largest refinery since 1980, which is the year of the last nationwide strike at refineries. A bagpiper played “Amazing Grace” as the participants, holding candles aloft in the dark, marched two blocks from the local union hall to the refinery. They wanted to place the crosses on the site where the workers had lost their lives. But police officers blocked their path. Marathon had called the cops. Marathon refused to acknowledge the tragic anniversary, even with a moment of silence at the refinery as BP had done annually. And it wouldn’t allow a commemoration by anyone else on its property either. The officers permitted the mourners to erect the white markers in a median strip along the highway, as often is done by family and friends of car crash victims. The ceremony participants called out each name, tolled a bell and placed the marker. Tears flowed. Just a few hours later, picketers saw managers leave the plant, descend on the memorial in the darkness and rip each of the 35 crosses out of the ground. Larry Burchfield, a member of the USW’s National Oil Bargaining Policy Committee and a machinist at the refinery for 20 years while it was owned first by Amoco, then BP and now Marathon, told me that disrespect Marathon showed for the dead is the same disregard Marathon shows for the living. Marathon’s “it wasn’t me; it was BP” reasoning for downgrading safety just doesn’t cut it. Don Holmstrom, director of the Western Regional Office of the U.S. Chemical Safety Board (CSB), explained why in an interview with the Galveston County Daily News for a story on the anniversary of the 2005 blast. “I think it is sad to report that not enough appears to have been learned, and the problem persists. It is not a BP problem. Although the incident occurred at (BP’s) Texas City refinery, there is an industry problem,” said Holmstrom, who was the CSB’s lead investigator into the 2005 blast. Marathon is no outlier, operating in perfect safety. Numerous problems have occurred at the plant since Marathon took over. An explosion and fire at the refinery on Feb. 21 last year critically injured Oscar Garcia, who was employed by a company Marathon contracted to perform work on the site. Garcia has sued Marathon for negligence. The refinery released more than 128,000 pounds of silica and alumina oxide into surrounding communities in two incidents this year. Several fires have occurred since the strike began, including two within 24 hours witnessed by picketing workers. After the BP explosion, the CSB and others recommended refineries refrain from placing personnel in temporary facilities near volatile units, especially during shut downs and startups. Many of those killed in the BP explosion were in temporary trailers during a unit start up. Despite that, within the past year, Marathon erected three lunch tents during a repair cycle on the same ground where bodies and debris had been hauled away after the 2005 blast. Not one of the 1,100 USW members who work for Marathon has crossed the picket line. They’ve gone without pay for nearly three months because they know what’s at stake: their lives. In another attempt to help Marathon hear that, workers replanted the 35 white crosses in a long line in front of the union hall. They managed to get them back from Marathon through the police department. Tomorrow, on Workers’ Memorial Day, which commemorates those who have lost their lives on the job, the USW members will place a solar spotlight in front of each cross, to highlight the lives sacrificed when safety was compromised. Hopefully, that will open the eyes of Marathon managers who deliberately closed their ears to the words of dead workers.